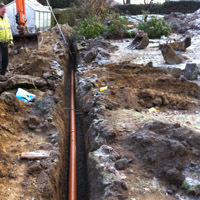 Dealing with domestic sewage is typically left to the water board, who deal with mains sewerage. If you're not on the main sewer, then you are probably going to have a septic tank system in place to deal with your sewage. The problem with septic tank systems is that they need to be emptied of waste water. This means a large soakaway, preferably a field, where the waste water is released. This can't be used anywhere near a fresh water course. But there is an alternative. "Whatever your needs, our expert team are here with the tools and experience to help." Rather than simply storing up the waste in a septic tank, there are domestic sewage treatment systems that can process the waste. Unlike older sewage treatment systems that required a large run off, these can be used in close proximity to a watercourse. The system purifies the waste using natural processes and bacteriological action. Because of the processing that takes place you can be sure that there is zero impact on the environment if the resulting purified waste water is discharged near a stream or river. For more information, contact our team on 01626 817 953. We look forward to hearing from you.